When planning a trip, average travellers looks at flight prices, hotel recommendations and local attractions at their destination. When traveling by yacht, however, you see things from a different angle than most tourists. We decide to visit places not because of availability of hotel rooms but by looking at potential anchorages. A safe anchorage is easy to sail in and out of, has protection from the predicted winds and swell and good holding in not too deep water. 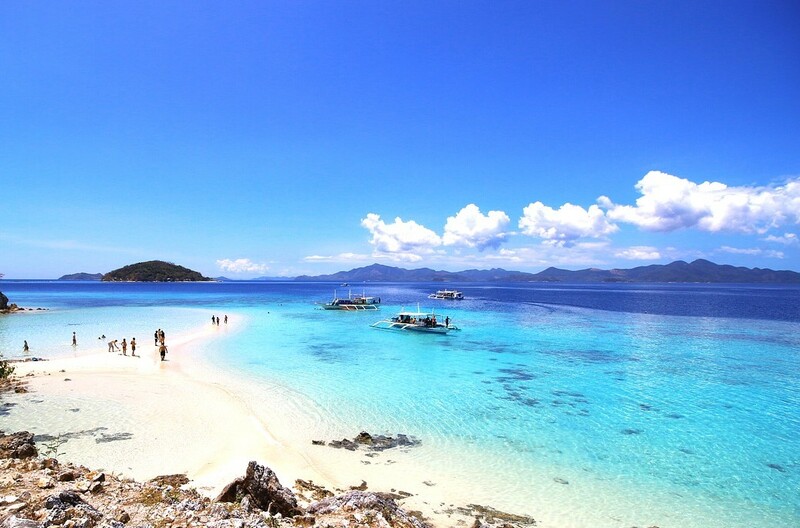 The Philippines is home to 7107 islands, which can make finding your next anchorage both an easy task, and completely overwhelming. On the chart the island of Malapascua looked like a perfect spot to stop. Little did we know it had a whole lot more to offer. Located in the Central Visayas region of the Philippines, just 4.5 NM east of the large island of Cebu, Malapascua Island is a mere dot on the map. Measuring 2.5km long and 1km wide it is accessible by ferry from Cebu City, the second largest urban centre in the country. 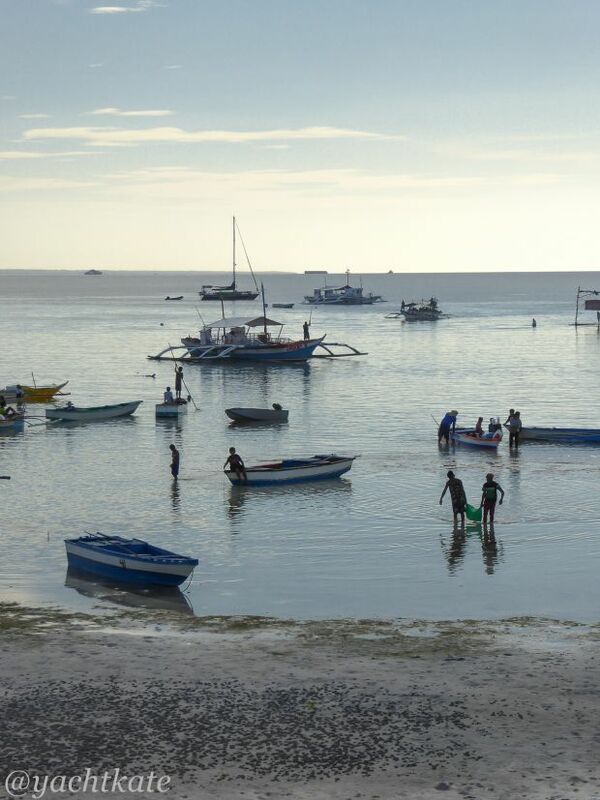 However, once you cross the Visayan Sea, Malapascua feels like it’s a world away. 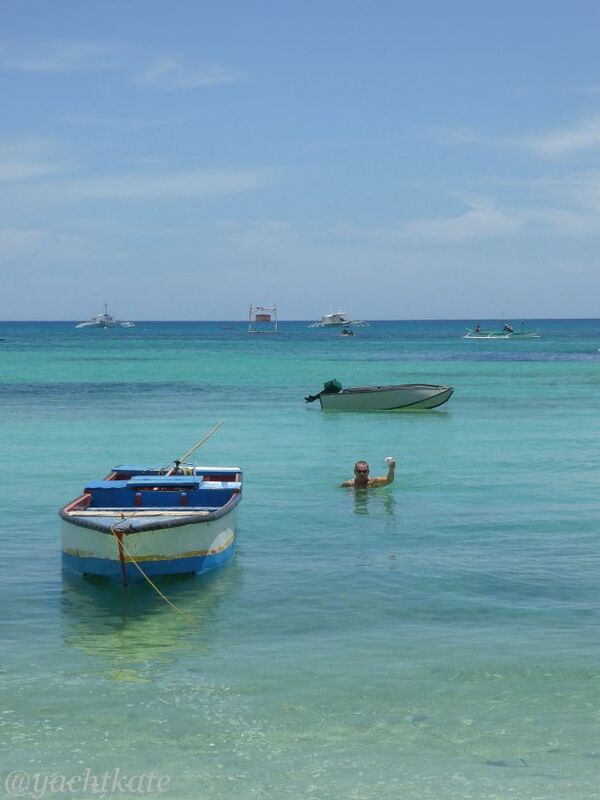 Known for its white sand beaches, crystal clear water and the year-round, world-class diving with thresher sharks the island has been a vacation hot spot enjoyed by international tourist for years. But it is the local tourists that cause the island to overflow one weekend in May, and we happened to drop the hook the day the boats from the mainland started to arrive. After setting the anchor in a patch of sand off a local beach strewn with fishing boats we settled into our usual routine of tiding up from the day’s sail and waiting to make sure that the anchor would hold. Happy that the boat was secure we put the outboard on the dinghy and went ashore to explore. Anchoring the dinghy in Malapascua. Photo by Heather Francis. Following the local boat traffic, we motored the dinghy down the coast and into a large, shallow and very busy bay. 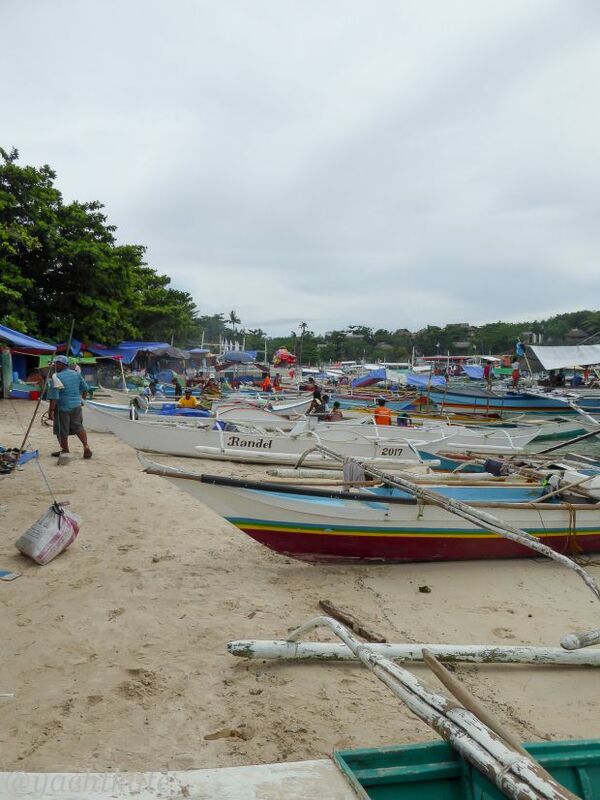 The beach was a confusion of boats and bodies, with everyone jockeying to get one of the last parking spots on the sand before the tide receded. Knowing that there were large tides and a slowly shoaling bottom we decided to anchor the dinghy off the beach, away from the crowd, strip down to our bathing suits and swim ashore. Walking around the island we were greeted with smiling faces everywhere we turned. Pop up stalls crowded the small streets close to the beach selling everything from pots and pans to blow-up beach toys. The breeze carried the now familiar aroma of spit roasted pig, a specialty of the Cebu area. We came upon a large, white church and finally learned what all the commotion was about. 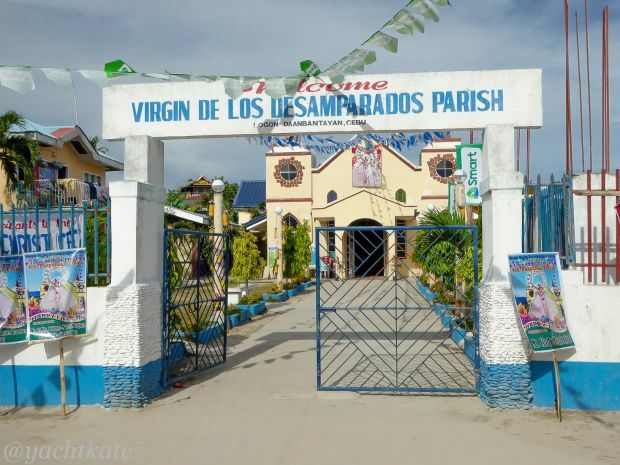 It was the Annual Fiesta of the Virgin de los Desamparados, the patron saint of Malapascua, and judging from what we’d seen on the island so far, it was going to be a big party. Church on Malapascua. Photo by Heather Francis. The next day, while enjoying coffee in the cockpit, we were treated to a front row seat to watch the parade of sail. Bangkas (the trimaran-style local motorboats) large and small were decorated and driven down the coast. Merry-makers old and young filled the decks, dressed for the occasion, singing and waving as they passed our stern. The most important boat in the parade was a large, elegant, white bangka that carried a statue of the Virgin de los Desamparados, blessing the island and the surrounding waters for the coming year. Hoping that there would be more to see and do ashore, we decided to treat ourselves to lunch on the beach. Before we even hit the sand, we stumbled on another, exciting display put on by the local boat owners: a high speed bangka race around the harbour. These were not the average boats used by the island’s fishing fleet but sleek, small vessels barely big enough for one man. Beach lined with Bangka Malapascua. Photo by Heather Francis. We joined the crowd of Filipinos huddled under the shade of the palm trees, trying to escape the scorching midday sun. Three boats at a time were lined up at the shoreline and readied for the next race to begin. Starting the loud, four-stroke inboard engines using a pull cord the driver had to be at the ready; the basic engines were direct drive and once started they were raring to take off. With a rooster tail of spray following them the three boats speed off across the turquois water, rounding two marks and then rocketing back to shore. The winner had a large lead and plenty of finesse, which is why he was the crowd favourite. As his competition arrived he drove elegant pirouettes around him, much to the delight of the onlookers. It was only after they crowned the winner did I realize that the race boats were not only small, they had no rudder. The driver used only his body to navigate the boat around the course and executed those high-speed, tight circles by subtly shifting his weight. It was an impressive feat of seamanship. 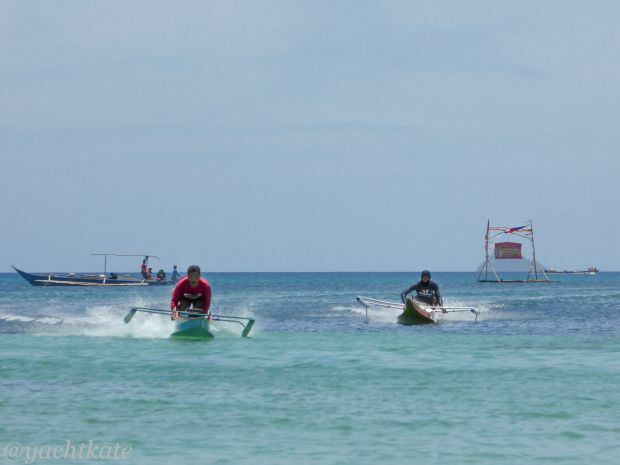 Bangka Races. Photo by Heather Francis. That evening, from our barstool above the beach, we watched as the weekend crowd arrived by the last ferry of the day. Low tide meant a long walk to shore through the tangle of seaweed and kids that played in the shallows. Extra people meant extra supplies, and as the light faded an endless procession of boys carried water, beer, bed rolls and food ashore on their shoulders, like ants stocking up for the winter. When we returned to the dinghy for a sunset ride home it was high and dry, but those same boys offered to help us drag it out into deep water. Low tide at dusk in Malapascua. Photo by Heather Francis. We didn’t go for the diving or the white sand beaches, we didn’t even know about fiesta. Like almost everywhere we’ve visited we were warmly welcomed and pleasantly surprised. We only spent three days in Malapascua, but they turned into one of most memorable weekends we’ve had in the Philippines. About the auther: Heather Francis is originally from Nova Scotia, Canada. For over a decade she has travelled the world living and working on the boats. In 2008 she and her Aussie partner Steve bought their Newport 41’, Kate, and have been sailing her full time since. They are currently looking for wind in the Philippines, you can follow their adventures at www.yachtkate.com. 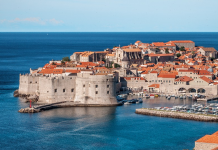 Learn more about sailing around some of the world’s best locations with our Sailing Guides here.